The California Legislature returns to the Capitol today to reconvene on bills. While CAI-CLAC has been successful at influencing and amending 2018 legislation, there is still work to be done on SB 1265. The GOOD news: SB 1265 will be amended to delete the ability of someone to copy the signed envelopes, mitigating privacy and fraud concerns. The BAD News: If passed, SB 1265 will increase costs to conduct an Association Board election due to unnecessary restrictions to serve. As written, the bill adds deadlines, notices and other requirements to the election process making it more complicated and more likely mistakes will happen – resulting in more litigation costs! There is simply no justification for government to impose higher costs to Homeowner Association members. We strongly believe that SB 1265 limits association’s ability to self-govern by mandating how we conduct community association elections. Join us on Twitter this Wednesday, 8/8 at 12p.m. 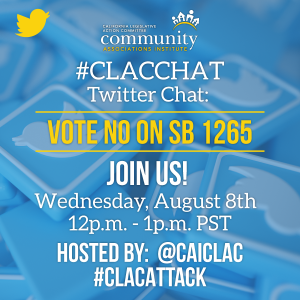 for our first ever #CLACCHAT on SB 1265 and help us make our concerns heard! CAI-CLAC will be hosting and sharing several tweets. You’re welcome to comment with your concerns or simply retweet our posts. Vote NO on SB 1265. Simply send our pre-drafted letter to your legislator by clicking here: caiclac.com/current-campaigns. Share this information with your community! Feel free to forward this email or copy the information provided to distribute to your own email lists. You can also invite your community to our twitter chat and include the graphic below. Thank you for helping make an impact. The more opposition we generate, the more influence we will have. So, please join us and make your voice heard!